New exhibition at The Hand in Llanarmon D.C., running from Oct.-Dec. this year. As you know, the Inside Out group has been invited to exhibit in the dining room of The Hand Hotel in Llanarmon D.C. by Martin and Gaynor DeLuchi since 2008. For the past five years we’ve run that exhibition along the lines of a “Current Work Show”, enabling artists to exhibit works from their current portfolio. Although we’ve always had a lot of interest in the exhibition (it’s even been mentioned in several reviews of the hotel), we’ve always known that visitors have liked the art more when it’s had a local flavour to it. We’ve also always known that it’s this art that generates more sales and more commissions. So, after some discussions with Martin and Gaynor, we’ve decided to try something different at The Hand. For the next year, we’ll be trying out “themes” for each quarterly exhibition. Each theme will reflect the locality, season or region, giving the group the chance to showcase the paintings, drawings, prints and photographs they do inspired by this particular corner of the country. 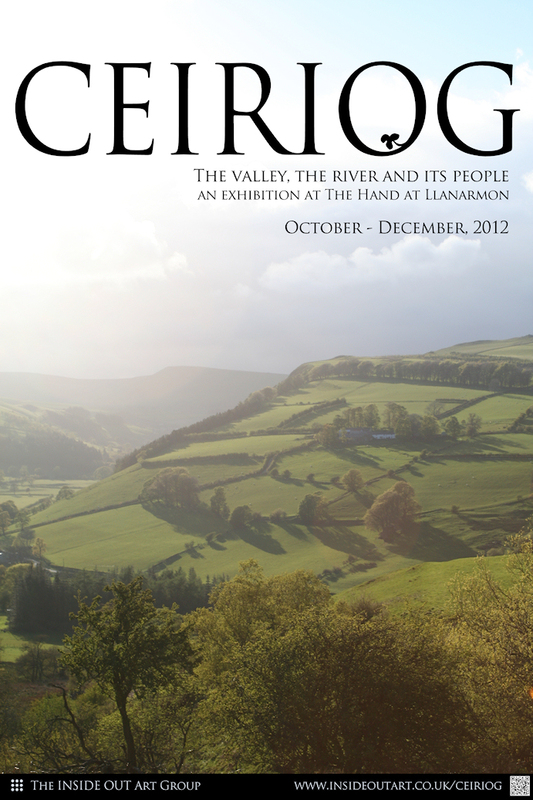 Our first theme, from October to December this year, is “Ceiriog“. This could be taken as the valley, the river, or even the poet. We’re looking for any artwork that reflects this theme. Although the exhibition is open, space is limited. Please contact us through the blog or by email as soon as possible if you’d like to submit work. A photo and measurements of your work is essential, so that we can work out where to hang the piece. Work accepted for exhibition needs to be brought to The Hand no later than Friday, Sept. 28th (which gives you 2 1/2 weeks), as we will be hanging on Sunday afternoon. As part of this revised programme of exhibition at The Hand, we will be doing more publicity for each quarterly show, with colour posters and press releases to local newspapers and organisations associated with The Hand. At the end of 2013, we will produce a catalogue of the year’s exhibition, for sale over the Christmas and New Year period. Hopefully this will help us make the most of the exhibition opportunity Martin and Gaynor have so kindly offered us over the years.